You can search the catalog using only the search bar, the search grid, or the search bar and the collection drop down menu. 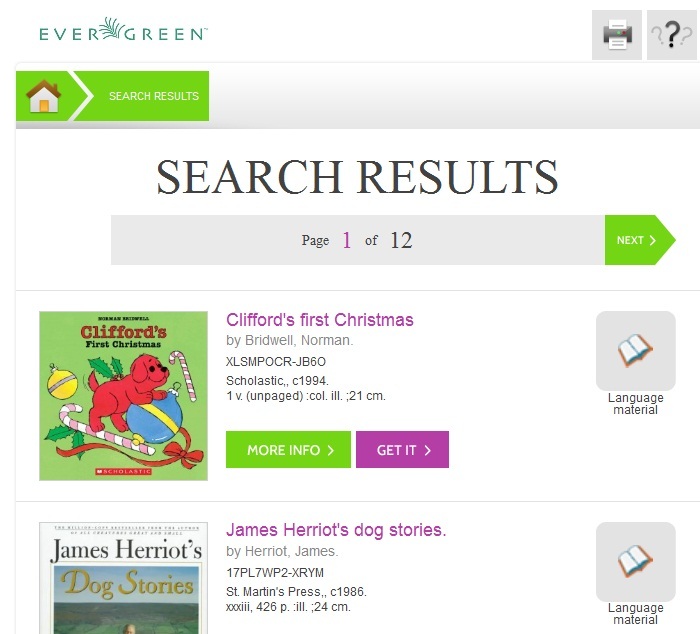 To search the catalog from the home page, enter text into the search bar in the center of the main page, or enter text into the search bar to the right of the results on a results page. Search indices are configurable, but the default search indices include author, title and (key)word. 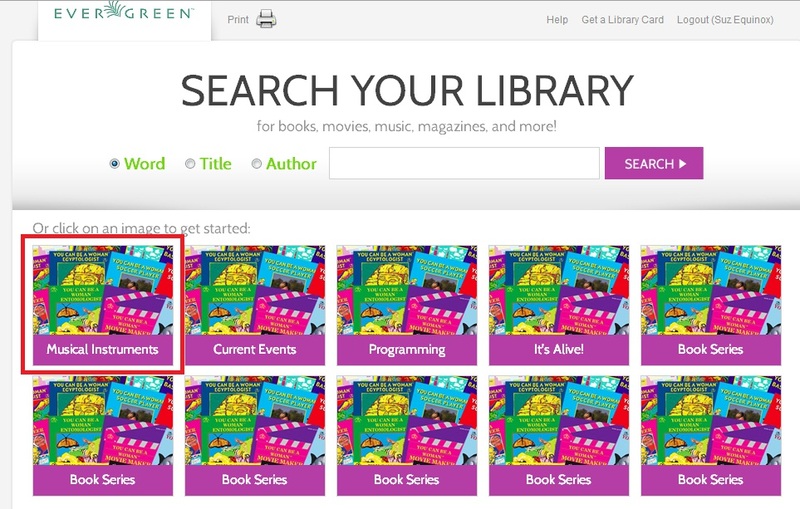 You can use this search bar to search the entire catalog, or, using the configuration files, you can apply a filter so that search queries entered here retrieve records that meet specific criteria, such as child-friendly copy locations or MARC audience codes. From the home page, you can search the catalog by clicking on the grid of icons. An icon search can link to an external web link or to a canned search. 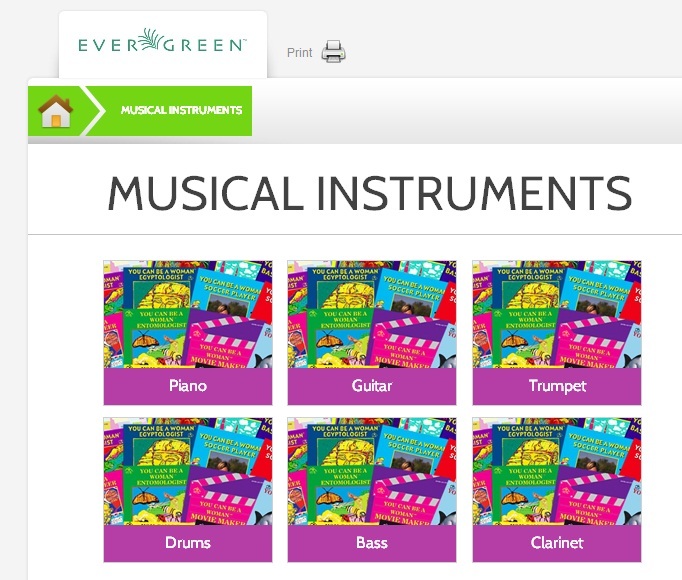 For example, the icon, Musical Instruments, could link to the results of a catalog search on the subject heading, Musical instruments. The labels on the grid of icons and the content that they search are configurable by branch. 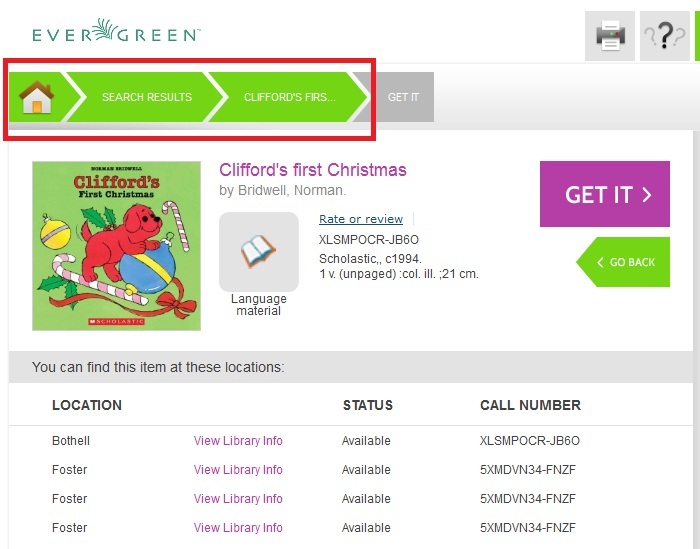 You can use the grid to search the entire catalog, or, using the configuration files, you can apply a filter so that search queries entered here retrieve records associated with specific criteria, such as child-friendly copy locations or MARC audience codes. On the search results page, a search bar and drop down menu appear on the right side of the screen. You can enter a search term and into the search bar and select a collection from the drop down menu to search these configured collections. Configured collections might provide more targeted searching for your audience than a general catalog search. For example, you could create collections by shelving location or by MARC audience code. Using any search method, the search results display in the center of the screen. Brief information displays beneath each title in the initial search result. The brief information that displays, such as title, author, or publication information, is configurable. For full details on a title, click More Info. The full details displays the configured fields from the title record and copy information. Click Show more copies to display up to fifty results. Use the breadcrumbs at the top to trace your search history.